The talk I gave at the Global Catastrophic Risks conference a while back is now up and online, so here's the link. It runs a bit less than 20 minutes, and they did a good job of embedding slide images into the presentation footage at appropriate times. Building Civilizational Resilience by Jamais Cascio, recorded by Jeriaska on Vimeo. As 2008 draws to a close, it's time to go through the piles of cognitive detritus left on my desk, and think back on what this year was like. Good: Lots of talks, lots of writing. Met some very interesting and fun folks in my travels. Finally accepted that I seem to know what I'm doing, at least part of the time. Bad: Poorly-juggled travel schedules. A few of the coolest projects got delayed into 2009, if they happen at all. My physiology decided that it hates me (warning, squicky medical images). Here are some of my favorite pieces from Open the Future 2008. Although I'm pretty sure I wrote fewer posts this year compared to last, there are more of them that stand out in my mind as potentially interesting. Let me know which ones you liked, disliked, or want me to revisit. And if I don't get around to posting again during the holidays, Happy Solstifestichrismakwanzakkah! The Big Picture: Climate Chaos -- wherein we look at how climate disruption mixes with a variety of other big issues. Please Don't Kick the Robots - on how biomimesis changes how we react to robot abuse. Roll +3 vs The Future - why Dungeons & Dragons made me what I am today (now you know what to blame). Pondering Fermi - boy, I seriously get my geek on here. As if the D&D post wasn't enough. Singularities Enough, and Time - waiting for a Singularity to save us isn't just a bad idea, it's actually beside the point. The Participatory Decepticon - how do you know that what you see on YouTube is really what happened? Making the Visible Invisible - augmented reality technologies mean an augmented reality society. And that may not be good. Tomorrow Matters - as much as today. This Changes Everything - giving you permission to slap a futurist. Legacy Futures - dead visions of tomorrow that still colonize our minds. GET OUT OF MY MIND! I have to admit something: I've been a business consultant. Not just in the consulting futurist sense, but also in the "let me help you innovate your product cycle, grow your stakeholders, and immanentize your eschaton" sense. Although I don't really do that any more, I'm still somewhat attuned to that language. So when this past weekend I attended the "2008 Venture Showcase" for the Presidio School of Management -- which specializes in sustainability MBAs -- a phrase used in passing by one of the presenters triggered an idea that, upon reflection, might be worth sharing. What popped into my head during the presentation was the term value ecologies. With the phrase in mind, a rough definition started to spill out: the collection of interdependent producers, suppliers, customers, shippers, competitors, supporters, creators of add-ons, and so forth, all contributing to the perceived value of a product or service, for better and worse. Unlike "value chains," which focus on how a product or service gets made, or "value networks," which focus on the web of buyers, makers, users, etc., that support a given product or service, a value ecology demands that we consider more than a single "species," makes no assumptions about mutual benefit, and offers no implications of stability. A given value ecology may include parasites (e.g., companies selling knock-off versions), predators (e.g., big companies looking to buy a smaller product/service provider in order to gain access to the employees), and diseases (e.g., poor performance, usually temporary but potentially fatal), all in a context of a changing environment (e.g., technology, global economics, and so forth). While this may seem like consultant-ese, this model could actually be useful for foresight practitioners looking to understand the potential for change in a given economic (or technological, or social) niche. You can't just look at how a product or service is made (value chain) or its complement of users and suppliers (value network), you have to think about the whole range of actors and institutions dependent upon and competing with that product or service. What's happening right now with the US automotive industry is a good illustration of the concept. If auto manufacturing in the US dies off, there are obvious concerns about the workers, suppliers, and buyers. But when you start to play out the larger web of interactions, you start to run into surprises. The death of US automakers could be a deadly blow to network television, for example; watch a few hours of prime time TV (without TiVoing over the ads), and you'll start to see just how dependent commercial television is on car advertisements. Large-scale sporting events are likely hurt, too, for similar reasons. A shift to higher-mileage vehicles (likely faster without the Big Three than with them) would reduce state incomes from gas taxes, and likely accelerate pressure to implement some kind of per-mile-traveled fee in order to pay for infrastructure. The demise of the big US automakers could also open up a niche for unexpected players to enter the market -- the Apple iCar has become something of a cliche, but one could imagine ExxonMobil (flush with cash) setting up a side-operation making cheap gas-only autos. Or Swatch cars making a come-back. Or even IKEA starting to make quick-assembly vehicles (perfect for the DIY crowd). A more positive version might be seen in something like the iPhone. Its value ecology would include the hackers who "jailbreak" the system to allow new kinds of applications, the competitors scrambling to come up with appealing alternatives (as well as the increased demand for similar devices), the users of other 3G phones on the same network as the iPhone finding the data tubes overloaded with iPhone surfers, web designers having to decide whether to make a site iPhone-friendly, perhaps even the makers of fingerless gloves -- remember that the iPhone touchscreen requires your uncovered fingertip. Any chance of a slight uptick in frostbitten fingers? I coughed up pretty much all of this in a moment's insight during the Venture Showcase, and later discovered -- much to my surprise -- that nobody used the term "value ecology" for anything even remotely similar to this notion (nearly all of the links found on the All-Seeing Eye of Mountain View simply had the two terms adjacent to each other). So, for all of you out there doing consulting and management-analsyis type work: is this useful? I learned a new term in conversation last night with a former GBN'er now involved in voting access work: knock and drag. ...if volunteers find a [registered voter] who hasn't voted, the volunteer is not to leave the doorstep until that person is off to the polling site. The term is most closely associated with Democrats, but is clearly of use to any partisan (and not just in terms of party politics). This phrase stuck with me while listening to GBN Network member/UC Berkeley political science professor Steve Weber dismiss the importance of the Internet in the Obama election. He said -- rightly -- that Obama won due to old-fashioned get-out-the-vote/on-the-street activism. But Weber missed something important, falling into the trap of thinking of the Internet and the physical world as somehow divergent. Yes, Obama's team did a masterful job of getting out the vote -- of knocking and dragging. But they were able to do so because of dense, rich, swiftly-updated information about voters, districts, and volunteers, information collected and made available via Internet tools. I suspect that Weber was thinking of Internet media in his dismissal of the Internet as a whole; while still a debatable point, there's at least a plausible argument that Internet media such as blogs and YouTube were less influential than they were visible. For Weber, it seems like there's the Internet, and then there's the Real World, and you use either one or the other. But the concept of the Internet as even metaphorically a separate place no longer works. It's all around us, embedded into a rapidly-increasing portion of our technologies and our activities. Weber's confusion actually strikes me as a good indicator that the Internet is well on its way to becoming metaphorical electricity: critical and ubiquitous, and effectively invisible. But like electricity, the Internet will only work for you when you use the tools it enables. The people who recognize this are likely to have a growing advantage over the people for whom the Internet remains a separate entity -- commercially, strategically, and politically. Two reports out this week hint at a new political alignment in the coming decades. Both reports focus on nanotechnology, but have implications well beyond. Research at the University of Wisconsin-Madison shows a strong correlation between moral doubts about nanotechnology and embrace of religion. "The level of 'religiosity' in a particular country is one of the strongest predictors of whether or not people see nanotechnology as morally acceptable," says Dietram Scheufele, a University of Wisconsin-Madison professor of life sciences communication and the lead author of the new study. "Religion was the strongest influence over everything." At the same time, Yale researchers have determined that doubts about nanotechnology align with larger cultural views about commerce and equality. The determining factor in how people responded was their cultural values, according to Dan Kahan, the Elizabeth K. Dollard Professor at Yale Law School and lead author of the study. "People who had more individualistic, pro-commerce values, tended to infer that nanotechnology is safe," said Kahan, "while people who are more worried about economic inequality read the same information as implying that nanotechnology is likely to be dangerous." According to Kahan, this pattern is consistent with studies examining how people's cultural values influence their perceptions of environmental and technological risks generally. "In sum, when they learned about a new technology, people formed reactions to it that matched their views of risks like climate change and nuclear waste disposal," he said. This combination shatters the Right-Left stereotype that dominate American politics. Religiosity is typically seen as conservative, while worries about economic inequality fall into the liberal bucket. Yet both map to strong concerns about nanotechnology. If the opinions uncovered in these surveys does map to larger views on science and technology, it suggests the shape that a new political alignment might take. Party politics aren't static; partisan evolution means more than just flipping which party means "right wing" and which one means "left wing." There could well be a reshuffling of positions in the coming decades, especially if religious evangelicals begin to see faith-as-stewardship as being more important than faith-as-moral judgment. One pair of surveys does not necessary portend a massive cultural shift, but it does offer a distant early warning of a possible change. This is definitely worth watching. The combination of science & liability may end up getting a lot of press in the Carbondämmerung era. The parallel of big tobacco and big carbon has always been compelling to me, but the Guardian reports that Oxford University physicists have developed a way to determine whether a climate disaster has a human causation. The technique involves running two computer models to simulate the conditions that led to extreme weather events. One model includes human-caused emissions of greenhouse gases, the second assumes the industrial revolution never happened and that carbon levels in the atmosphere have not increased over the last century. Comparing the results pins down the impact of man-made global warming. "As the science has evolved this is now possible, it's just a question of computing power," he said. This seems like a decent way of telling whether a given event is greenhouse gas related, but won't pin the carbon on the emitter. It's possible that a more detailed process could narrow down the likely sources, but I'm dubious. I expect that the carbon lawsuits are likely to go the same route as the tobacco suits: lots of noise, lots of outrage, but very few convictions. I used the term 'legacy code' in one of my novels, and Farah Mendlesohn, a science-fiction critic who read it thought it was a term I had made up, and she promptly adapted it for critical use as 'legacy text'. Legacy text is all the other science fiction stories that influence the story you're trying to write, and that generally clutter up your head even if you never read, let along write, the stuff. Most of us have default images of the future that come from Star Trek or 2001 or 1984 or Dr Who or disaster movies or computer games. These in turn interact with the tendency to project trends straightforwardly into the future. What immediately struck me is that we all have this kind of cognitive "legacy code" in our thinking about the future, not just science fiction writers, and it comes from more than just pop-culture media. We get legacy futures in business from old strategies and plans, legacy futures in politics from old budgets and forecasts, and legacy futures in environmentalism from earlier bits of analysis. Legacy futures are rarely still useful, but have so thoroughly colonized our minds that even new scenarios and futures models may end up making explicit or implicit references to them. In some respects, the jet pack is the canonical legacy future, especially given how the formulation (originally from Calvin & Hobbes, I believe), of "where's my jet pack?" has become a widely-used phrase representing disappointment with the future instantiated in the present. People who follow my Twitter stream may recognize another example of a legacy future: Second Life. While the jet pack never really became part of anything other than Disneyfied visions of Tomorrowland, over the past five years or so Second Life came to represent for professional forecasters and futurists the vision of the Metaverse. Even though Second Life has yet to live up to any of the expectations thrust upon it by people outside of the online game industry, it has doggedly maintained its presence as a legacy future. Just like legacy code makes life difficult for programmers, legacy futures can make life difficult for futures thinkers. Not only do we have to describe a plausibly surreal future that fits with current thinking, we have to figure out how to deal with the leftover visions of the future that still colonize our minds. If I describe a scenario of online interaction and immersive virtual worlds, for example, I know that the resulting discussion will almost certainly include people trying to map that scenario onto their existing concept of how Second Life represents The Future. Sure, Second Life futurism may be a particular irritant for me, but the legacy futures concept can have much more troubling implications. We can see it in discussions of post-petroleum transportation that continue to elevate hydrogen fuel cells as The Answer, even though most eco-futurists and green automotive thinkers now regard that technology as something of a dead end. We can see it in population projections that don't account for either healthcare technologies extending both productive lives and overall lifespans. We can see it in both visions of a sustainable future reminiscent of 1970s commune life, and visions of a viable future that don't include dealing with massive environmental disruption. All of these were once legitimate scenarios for what tomorrow might hold -- not predictions, but challenges to how we think and plan. For a variety of reasons, their legitimacy has faded, but their hold on many of us remains. How do we deal with legacy futures without discouraging people from thinking about the future at all? What scenarios considered legitimate today will be the legacy futures of tomorrow? ...In case anyone is curious, here are the slides I used at the Global Catastrophic Risks conference in Mountain View, California, last month. Enjoy. Something I didn't get to go into, but is on my mind these days, is the possible political shake-up coming in part from how we respond to climate disruption. 2030 is a good target point for this issue, since I'm fairly confident that by then we'll have seen some significant changes in how we govern the planet. This scenario most likely to make this apparent is one in which we embark upon a set of geoengineering-based responses to the climate problem (not as the sole solution, but as a disaster-avoidance measure), probably starting in the early-mid 2010s. These would likely be various forms of thermal management, such as stratospheric sulfate injections or high-altitude seawater sprays, but might also include some form of carbon capture via ocean fertilization, or even something not yet fully described*. Mid-2010s strikes me as a probable starting period, mostly out of a combination of desperation and compromise; geo advocates might see it as already too late, while geo opponents would likely want to have more time to study models. As a result, by 2030, while various carbon mitigation and emission reduction schemes continue to expand, a good portion of international diplomacy concerns just how to control (and deal with the unintended consequences of) climate engineering technologies. It's not impossible that there will be an outbreak or two of violence over geo management. I wouldn't be surprised if at one point, the world ceases geoengineering, only to find temperatures bouncing back up quickly; geo would then almost certainly be resumed. This is a challenging world, and not just because of conflicts over control or the potential for unexpected impacts. It's a world in which the two familiar models of power -- "hard" military power and "soft" cultural power -- don't adequately describe the arena of competition. 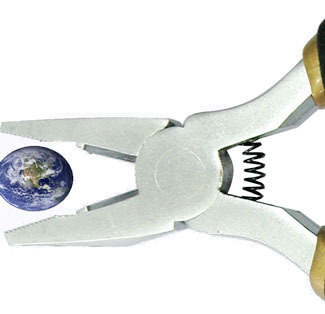 Although geoengineering might have the potential to be used harmfully, it would be insufficiently visible, swift, and controllable to serve as a broadly useful form of force; similarly, the memetic elements of a geoengineering strategy are keenly focused on scientific debates over uncertain results, a form of discourse which tends to be opaque to most citizens. And the struggles over geoengineering wouldn't be happening in a vacuum. Over the next couple of decades, we'll be dealing with multiple complex global system breakdowns, from the present financial system crisis to peak oil production to the very real possibility of food system collapse. Climate disruption, with or without geoengineering, clearly falls into the category, as well: systems in which neither hard nor soft power work very well. All of these problems demand greater information analysis, long-term thinking, and accountability than traditional forms of power tend to offer. The era of overlapping system threats is now clearly underway, and geoengineering will be a highlight of that period. New patterns of international behavior will almost certainly have emerged by 2030. My gut sense is that they'll have a strong legalistic component; in particular, one of the major points of debate over geoengineering will be liability for negative consequences. Given the need to deal with these overlapping crises, we might imagine the third form of power (beyond hard and soft power) as a kind of "administrative" power. (There's an intentional echo here of Thomas Barnett's "sysadmin force" concept, but this isn't meant as a direct link.) Although much of what I've been discussing here about administrative power focuses on the actions of states and transnational entities, the same concept could easily be applied to bottom-up groups and movements (just as hard and soft power concepts operate at both ends of the scale). I know that the notion of administrative power as a parallel to hard & soft power isn't quite right. But there's something there about an alternative model of competition that works directly with complex interconnected global systems. Geoengineering won't be the cause of it -- really, the emergence of administrative power (or whatever you call it) is already underway -- but could well be the action that makes this model of power clearly visible. And yes, "administrative power" is a boring name. * To be clear: I'm not endorsing any of these models in particular, only noting that they're currently the ones seeing the most discussion.